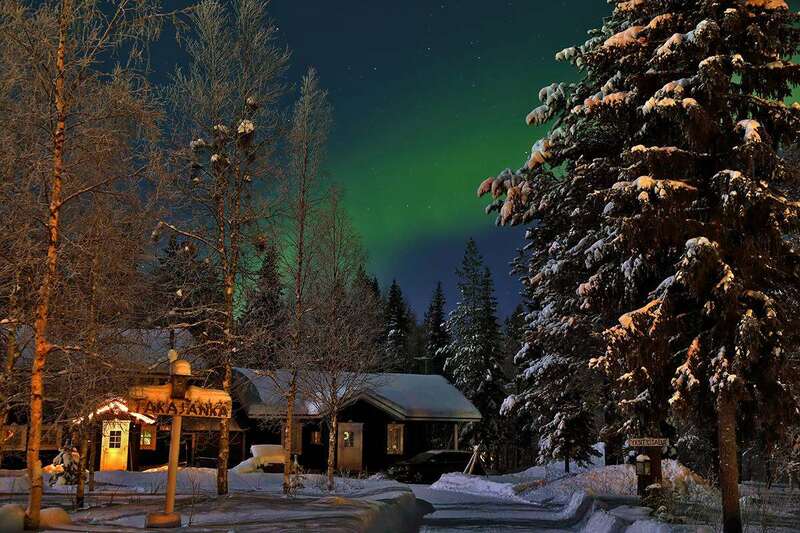 Our selection of idyllic, high-quality, well-equipped log cabins is perfect for families looking for an extra special Lapland experience. All centrally heated cosy modern cabins come with their own sauna, fireplace and fully-equipped kitchen, and are dotted around the woods 500-900m from either Äkäs or Kaltio hotel. Most excursions depart from these two hotels. Guests have the option of pre-booking half board or self-catering. There is an excellent large well-stocked supermarket in the village centre. (All cabins vary in appearance and may be round or flat log or adjoin another cabin). All Log Cabins have shower, WC, sauna, fireplace (wood included), TV, VCR or DVD, oven, fridge, microwave, toaster, coffee-maker, dishwasher, hoover, iron, drying closet and washing machine. Guests may pay to use 'Äkäs' Hotel pool and sauna. Linen, towels and final clean is included. We include basic supplies so you do not have to worry about going shopping the moment you arrive. Exact contents vary but will normally include bread, milk, tea, coffee, sugar, fruit juice, cereal, cheese and biscuits. (Not applicable if pre-booking optional half board).